Happy wife, happy life, right? Well even though it may be true in our house that if mama ain’t happy, ain’t nobody happy I have found over the years that if daddy isn’t happy, then we aren’t all that happy either. And the daddy in our house loves him some Thai food, even if mama does not. This recipe though is a mutual favorite, which a badly stained page in the family cookbook can attest to. This mama doesn’t even like coconut (the only definite exception to that rule being a Girl Scouts somoa cookie) and I love this dish. 1. Cut the chicken into roughly 1 inch cubes. Place the cut chicken into a large bowl and set it aside. In a small bowl, stir together the curry, 1/2 teaspoon of the salt, pepper and chili powder. Once they’re evenly combined, sprinkle the spice mix over the chicken, then toss together until the chicken is nice and coated. Cover the chicken and chill in the refrigerator for at least an hour, but no more than two. 2. In a large skillet stir together the onion, basil, garlic and peppers in the olive oil heated over medium-high heat for 3-4 minutes , or until the onion is translucent. Add in the chicken and then stir in the remaining 1/2 teaspoon of salt and cook for 5-6 minutes, or until the chicken is cooked through. 3. In a separate bowl, stir the coconut milk and cornstarch together until evenly combined. Slowly pour the mixture into the skillet, stirring constantly until evenly incorporated. Continue to cook, stirring, until the sauce has slightly thickened and is gently bubbling. now stir in the ginger and let the mixture bubble for another minute or so, again stirring vigorously. Remove the skillet from heat and Serve over hot rice. 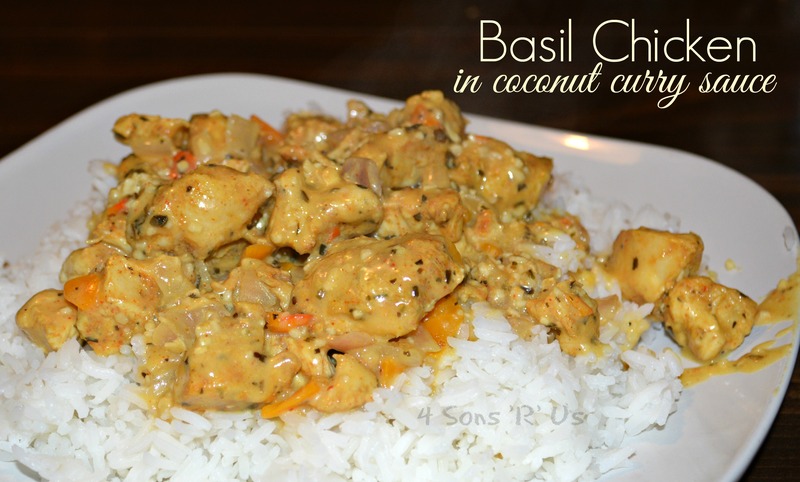 Sounds tasty – we have some coconut-based curry favorites in our family too! Thanks for sharing with FF. I love curry and this sounds very good. It’s not as curry-ish (or as spicy) as a traditional curry, which is probably why it’s such a meet in the middle meal for the hubs and I. It’s dee-lish!